After H&H Bagels grants the union’s request to give employees $5.35 per hour, the 12 year strike ends and Kramer goes back to work at the bagel conglomerate. But after being denied time off for his observance of The Festivus holiday, Kramer goes back on strike in demand of getting the holiday off. Could Kramer have been fired during the first 12 year strike? What about his Festivus strike? The National Labor Relations Act provides basic rights to workers to take concerted action to protect their interests. The act provides legal protections for workers to engage in collective bargaining with employers, organize into unions, and even go on strike if necessary. However, the Act only protects lawful strikes in protest of unfair labor practices by employers; these are outlined in Section 8 of the Act. For example: the act protects the right of workers to strike when an employer refuses to bargain collectively with the union, discriminates against employees attempting to enforce their rights, interferes with in an attempt by employees to form a union. Workers can also strike in order to advocate for better working conditions, such as better pay, workplace safety, and time off. Most importantly, workers can not be fired for going on strike, but only if it is for a lawful reason. Strikes that are made for unlawful reasons do not afford protections for workers. Advocating for better wages is exactly the kind of strike that is lawful according to the NLRA. Kramer would be protected by the Act in his fight for $5.35 an hour, and could not be fired during the 12 year strike because the strikes was conducted for lawful reasons. While H&H could hire SCAB! SCAB! SCAB! during the union strike in order for the bagel shop to stay in business, Kramer would have to be reinstated once the strike is over, or at least be first-up to get his job back once a job became open. Since H&H hired Kramer back as soon as the strike ended and he went back to work, both Kramer and H&H acted appropriately and neither one would face legal liability for their actions during the strike. Despite management’s claim, it is also likely that Kramer’s strike to exercise his right to celebrate new holidays would also be considered a lawful strike, as it is in advocacy of more time off. However, in this case, Kramer is acting as a single worker and not as part of a union. Once a union has been formed, collective bargaining must be made by the union on behalf of the employees with the employer. While this ensures that the employer does not take advantage of individual employees, it also means that the employees are bound by the collective bargaining process and can not go beyond the union by signing individual contracts with the employer. This is true even if they are for better wages, benefits, or other terms that are beneficial for that individual employee. The union provides the union members with collective power, but it also limits the individual employees to the terms negotiated by the union. 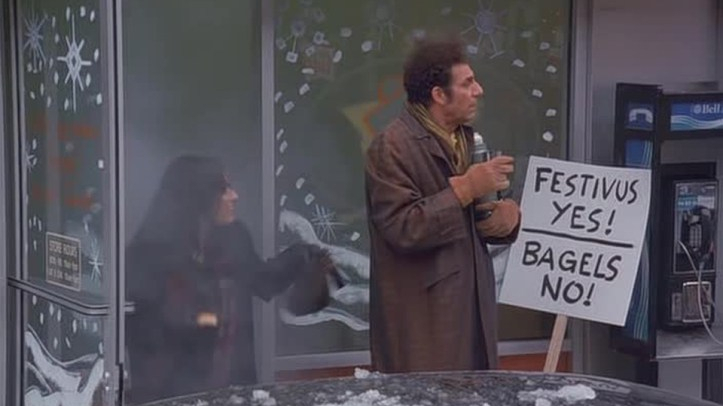 While Kramer may individually request time off for Festivus, since it seems that there is a union for H&H Bagels employees, Kramer can not just individually go on strike to demand vacation for that holiday. Additionally, he would likely be barred from even signing an individual contract with H&H that granted him, and only him, Festivus off. Walking off the job as an individual does not constitute an employee strike, it’s just one guy walking off the job. Therefore, although the reason Kramer goes on strike may be for the lawful reason of pursuing more vacation time, the law would not actually protect Kramer in this situation since he is acting alone. Kramer would probably not be protected by the National Labor Relations Act anyway due to some of the measures he took while on strike. For instance, he sabotages the steam machine in the bagel shop, not only causing destruction to the facility but also making it difficult for customers to shop because of all the “steaminess.” This kind of harm to the business is in violation of the NLRA. Furthermore, Kramer directly tries to stop customers from entering the store. While picketing outside the store front is protected activity, intimidating potential customers from patronizing the business would be in violation of the NLRA. As is dropping gum into the dough.